As campaign advertisements funded by Super PACs dominate the airwaves in the lead-up to the South Carolina primaries this Saturday, 54% of registered voters say they have heard about the 2010 Supreme Court decision that allows corporations and individuals to spend as much money as they want on political advertising as long as it is not coordinated with candidate campaigns. Fully 65% of those who are aware of the new rules on independent expenditures say they are having a negative effect on the 2012 presidential campaign. 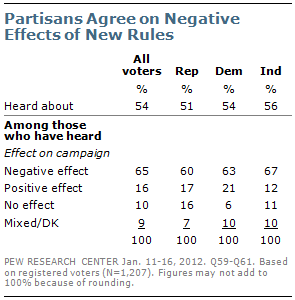 And among those who have heard a lot about these new campaign finance rules, 78% say the effect has been negative. 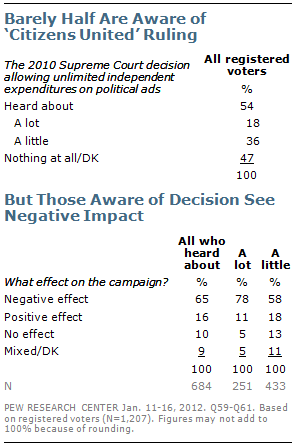 There is no substantial partisan divide in awareness and opinions of the new campaign spending rules. Roughly half of Republicans, Democrats and independents alike have heard about the court decision allowing unlimited independent expenditures. And among those who have heard about it, comparably wide majorities in each group say it is having a negative effect on the campaign this year. Men are more likely than women to say they have heard at least a little about the Supreme Court decision and its effects, and awareness is also higher among college graduates. There is little difference in awareness across age or region of the country. Among those who have heard about the decision, majorities of all groups see the impact on the 2012 presidential campaign as negative.